What is it like to be a TDS Technician? For some it’s a challenging yet rewarding position where no two days are the same. Duties range from installs, repairs, and maintenance. But for Ryan McNamara, a Broadband Technician in Southwest Utah, being a TDS Technician is a passion. Ryan started working for TDS as a Technician in 2015 with absolutely no cable experience. He was new to the area working for a glass manufacturing plant when he decided to seek a change. When he saw that the job description for TDS Technician involved something he loved – computers and electronics – he decided to apply. After going through the interview process and being hired, Ryan said he felt he finally found his calling. He loved the hands-on experience the position offered, as well as learning more about how cable, telephone and internet worked. “When I first started, after a shift I found myself going home and researching things I had encountered that day and try to learn all I could about it”, said Ryan. Even after working for the company for over three years, Ryan said the one thing he’s learned “is that I still have a lot to learn.” Recently, Ryan encountered an outage issue that he had never experienced before. 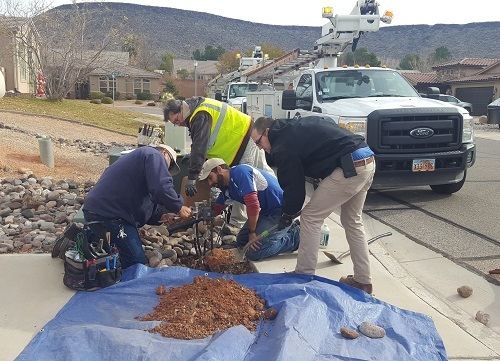 It was a multi-home outage in St. George, Utah that required Ryan to respond immediately. 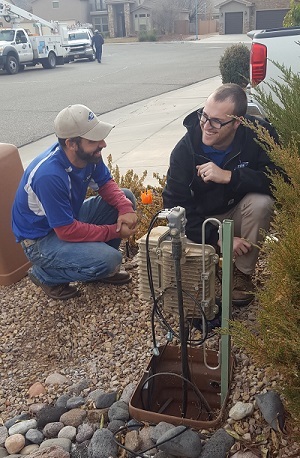 Ryan began checking each Service Tap (the point where a customer’s line hooks up to a TDS mainline so that a customer can receive service) in the area to see where the connectivity problem was occurring. In his search, he found a Tap had been backed over by a vehicle and needed to be replaced. Having never replaced a damaged Tap before, Ryan relied on his coworkers Matthew Neilson, Fred Dumas and Al Ricafrente to teach him how to complete the task. The group worked together, and within only an hour, the outage had been resolved. He recalls an instance that was supposed to be a simple serviceability check but turned into him going in personally and finishing an install for a customer who had been having connectivity problems for nearly two weeks. Upon arrival, Ryan could see the customer was in distress. The family had been without internet services after moving into a new home with two young children out of school for the holidays. The mother was exhausted from the stress of moving and entertaining her children all day long. After expressing her concerns, she was ecstatic when Ryan took the extra time and effort to set up her services once it had been determined she could be connected. The remainder of Ryan’s day went on as normal. A maintenance request, and two trouble calls with simple fixes. Each task Ryan took on his duties with ease and showed nothing but exceptional customer service skills. “I [feel] lucky that TDS took a chance on me” says Ryan, “and I’m happy to give back and help the company succeed”. What may be considered menial for a TDS technician means everything for our customers. The work that our techs do every day is no small task and so on behalf of everyone, thank you all for your hard work in keeping our communities connected. Learn about employment opportunities at TDS, by clicking here.